If you have a garden, or have helped out in someone else’s garden, you’ll know that the list of jobs seems endless. Seeds need planting and fertilizing, branches need lopping to stop over-hanging trees shading your vegetables, bushes need pruning to thicken them up, and fruit and vegetables need harvesting. In a natural habitat, many of these tasks are performed by wild animals as they feed, play, build nests or display. Naturalists have been observing these interactions between animals and plants for hundreds of years, and yet many of the intricate ecological relationships are still poorly understood. Animals and plants are in fact interdependent, so if you protect a forest from illegal/unsustainable logging, you are only protecting half the forest. You must protect it from illegal/unsustainable hunting too or the forest ecosystem will not work. Most flowering plants need to exchange pollen to bear fruit or seedpods. Insects are the best-known pollinators, but in some parts of the world nectar-feeding birds, bats and primates can also play this role for certain plant species with large flowers. Seed dispersal can be by wind (for example, sycamore and ash trees), water (coconuts and mangroves) or burrs (seeds with hooks on such as goose-grass and burdock), but in the tropics, more than three-quarters of tree species rely on animals to eat their fruit or pods and disperse the seeds in their droppings. Millions of years of co-evolution with fruit-eating animals has led these plant species to have seeds with a tough outer coat (or integument) able to withstand being chewed and passing through the acidic gut of the animal. It is so tough that these seeds don’t germinate well unless they have been chewed and partially digested while passing through an animal. The time this takes is usually enough for the animal to travel some distance from the parent plant, thereby assisting gene flow. It also protects the seed from seed predators that might destroy it. The resulting germinating seed has another advantage too – it is deposited in a package of first class organic manure that boosts the growth of the seedling. Germinating seeds need sunlight, but the forest floor is mostly shaded by the canopy overhead. When an elephant pulls on a liana and breaks a branch, or an ape builds a treetop nest, this creates a light gap for a few months until the tree sprouts new twigs to fill it. If the light gap is made by a great ape building a nest, there is another bonus for the forest because the first thing apes like to do in the morning is to relieve themselves, depositing a pile of poo beneath their nest, full of the seeds from yesterday’s fruit. How convenient that these seeds have fertiliser and light to start their journey upwards to the sun! As primates gather leaves from the branch tip, or antelopes nibble the buds on lower twigs, they also eat the meristem – the bit at the end of a shoot that grows the new leaves. Like a gardener using pruning shears, this stimulates growth of the buds further down the stem causing a bushy new growth until one of these lateral shoots becomes the new lead shoot and begins suppressing the others. Whether or not animal dung contains seeds, it plays another essential role in ecology – recycling nutrients. Dung is food for insects, other invertebrates and microbes, which break it down so the nutrients it contains become part of the soil and food for plants. This applies whether we are talking about caterpillars or elephants. 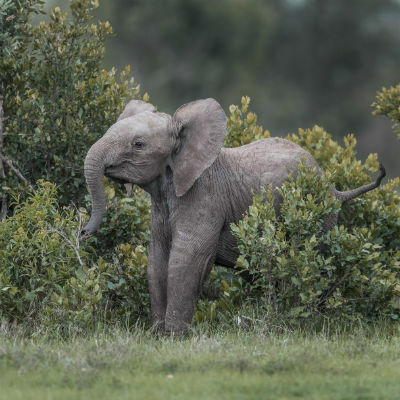 An elephant eats about 4% of his or her body weight in vegetation every day, so a five tonne elephant is producing more than a tonne of manure every week – spreading it around the forest and savannah. That’s 52 tonnes of dung every year for every elephant! That sounds impressive, but if you add the weight of all the termites, ants, woodlice, caterpillars, etc. together, the biomass of invertebrates is probably much more than the weight of all the elephants – so protecting small animals is as important as large ones. The word ‘pest’ is a human term for an organism that feeds or grows on plants we consider useful. It is rare for these species to cause a problem in nature but when humans grow a single crop over a large area, it can create conditions for a population boom in plant predators. In a natural ecosystem, animals feed on these potential pests and this controls their numbers. Even herbivores can help; some species of weevil lay their eggs in the seedpods of Acacia trees. These weevils are common under trees with lots of pods, and so many of the seeds are destroyed by the weevil’s larvae – unless the pods are eaten by elephants! Being carried inside an elephant not only disperses the seeds and deposits them miles from the parent plant, it takes them away from the weevils so they are even more likely to germinate. Perhaps every gardeners’ favourite job is to enjoy the fruits of their labour. Although animals are unaware of the consequences of their ‘gardening’, their feeding behaviour does affect the plants. When herbivores gather leaves, the plant responds by growing more; when frugivores pluck ripe fruits, or in the case of elephants, shake them out of the tree, it speeds the ripening of unripe fruit. And for humans who share their habitat and enjoy eating the same fruits, they benefit from the increased productivity that ensues. If we value the forests for all the ecosystem services wild animals provide, then we must do everything that we can to protect the animal components of the forest ecosystem.